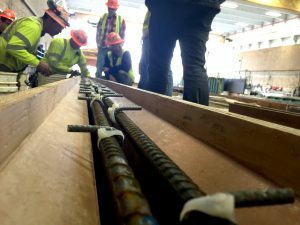 Oregon State University earned third place among competitors throughout North America at the Precast/Prestressed Concrete Institute (PCI) Big Beam Contest. The contest objective is for student teams to fabricate and test a precast/prestressed concrete beam with the help of local PCI members. The beam must be made primarily of concrete without any trusses, arches, or other non-flexural members. Prizes are awarded to the top 20 performers in consideration of efficient design, highest load capacity, and other categories. The Oregon State team from the College of Engineering’s School of Civil and Construction Engineering was comprised of Tyler Oathes, Cody Tibbits, Neil Schweitzer, Taylor Kiefel, Anh Nguyen, and Jonathan Kopp with faculty advisor Keith Kaufman, and PCI producer Knife River – Prestress of Harrisburg, Ore.
Congratulations to the students on an outstanding performance and thank you to PCI producer Knife River for your continued support of student learning at Oregon State.